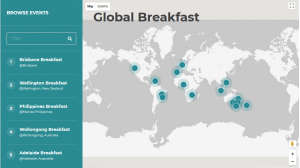 As part of the celebration of the centenary of IUPAC in 2019, as well as the International Year of the Periodic Table, scientists and students from across the world are invited to join in a Global Women’s Breakfast. You can submit an expression of interest or register the event using the online form link here. The idea is to have as many women chemists as possible to be involved in the global networking event. Please share this opportunity with women chemistry networks and women chemists in your region, and encourage them to join in the global handwave of celebration on the single day of 12 February 2019. 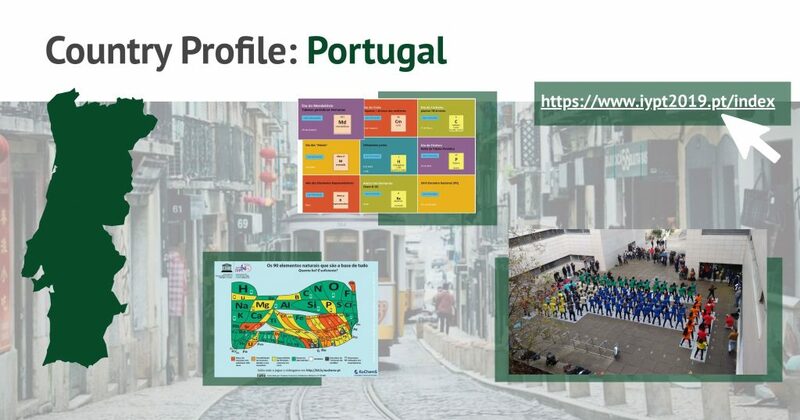 Read more about the IUPAC initiative here! In celebration of the 100th anniversary of IUPAC and the International Year of the Periodic Table, IUPAC and the International Young Chemists Network (IYCN) announced the creation of a Periodic Table of Younger Chemists. Beginning in July 2018 and ending in July 2019 at the World Chemistry Congress and IUPAC General Assembly, a diverse group of 118 outstanding younger chemists from around the world who embody the mission and core values of IUPAC will be celebrated. The resulting periodic table will highlight the diversity of careers, creativity, and dedication of the young chemists leading us into the next century. 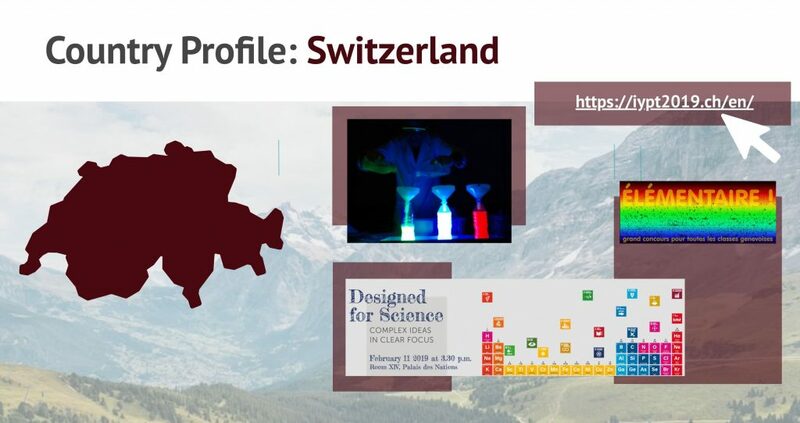 Winners will be profiled on the IUPAC100 website and will receive a certificate from IUPAC. Elements of the Periodic Table of Younger Chemists will be revealed over time in order of scientific discovery (see Wikipedia). Approximately eight elements will be revealed each month beginning in July 2018 with the final elements being awarded at the IUPAC General Assembly and World Chemistry Congress in Paris, France in July, 2019. Don’t wait any longer, nominate a Young Chemist! Read more about this IUPAC and IYCN initiative here. 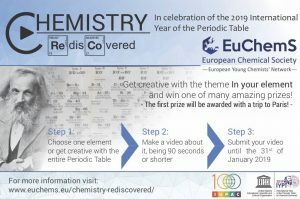 The European Young Chemist’s Network (EYCN) has launched the second edition of its video competition Chemistry Rediscovered. All young chemists and interested people of 12-35 years old are invited to send in videos on the theme “In Your Element”. The best videos will be awarded wonderful Periodic Table related prizes and the main prize will be a trip to Paris! Read more about it here.